I work in a day care. I work as a Montessori teacher in a Montessori day care. Watching children repeat the same habits every day in the school. Habits like pushing your chair in when you get up from the table. Put your place mat away after meals. Put your dirty dishes in the sink and clean it. Flush the toilet after using it. Mop up the floor when you spill some water. 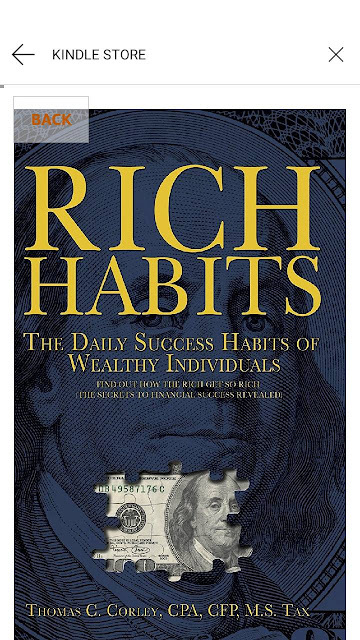 This morning, again I was listening to Rich Habits by Thomas Corley this morning. It's an audio book on the Audible app which I listen to on my mobile phone. The author wrote that we need good luck to be financially successful. However good luck comes from practising consistent good habits every day. Success is the good fruit that results from the discipline that we put into practising good habits each day. "Rich habits are like a magnet for opportunity luck"- Thomas Corley. 1) I will form good daily habits and follow them every day. Good daily habits are the foundation of success. 2) Successful people set goals and create a plan to reach those goals. In essence, a dream is just a dream until a person sets concrete goals in order to reach them. 3) I will engage in self improvement every day. Successful people read literature/industry periodicals that relates to their industry and work. They become students of their trade, and keep current with changes that occur. They do not spend excessive time surfing the internet or watching television. Successful people read for self improvement that will help them better improve in their jobs. Self improvement involves engaging in some activity every day that will improve your mind and better your mind to improve your career. As your knowledge base grows, opportunities begin to present themselves. As a minimum, set aside 30 mins each day for these activities. Successful people make a concerted effort to eat right, and exercise every day. They consider not just what they eat, but how much they eat. Successful people do not binge, or over indulge in food. If they do slip, it is managed over indulgence. Exercise is a routine, and improves theirs bodies and mind, and immune system. Managing weight means monitoring their calories, and food intake and engaging in a daily exercise regimen on a consistent basis. An easy way to monitor food consumption is to count the calories after every meal or snack, and document daily consumption. In beginning a weight management programme, first understand the food that you eat, and track what you eat figuring the calories. Do not confuse monitoring food consumption with diets. It does not mean starving. You simply need to understand that you can't eat high caloric food on a regular basis. So, these are some of the rich habits as stated verbatim from his book. Think and meditate on these things as we approach the new year, and work out how you can set out your own rich habits for a more successful and productive year.